Liverpool visit West Ham on Saturday afternoon and SportNation are offering the best price boost on this Premier League match! 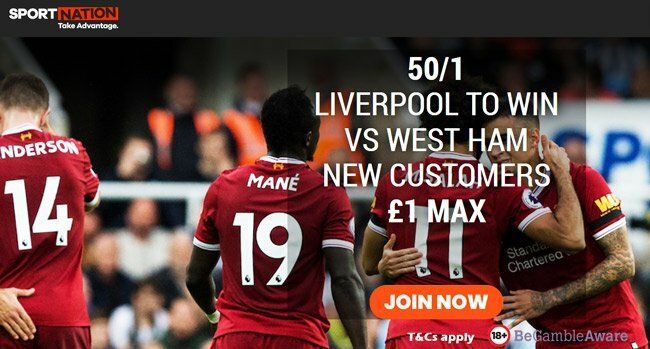 Read here how to claim 50/1 Liverpool to beat West Ham! Max bet £1! Liverpool enter this clash on the back of two 3-0 victories - against Huddersfield in Premier League and Maribor in CHampions League. When the Reds and West Ham last met, Liverpool won 4-0 at the London Stadium towards the end of the past season. You are just 3 steps away! 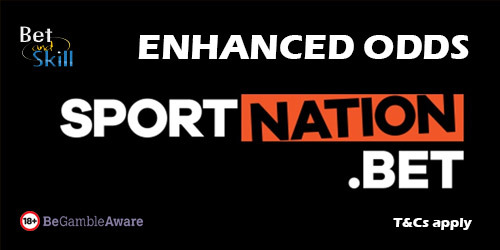 Join Sport Nation via our special links or banners! Simply register and deposit through the promotional page. Then proceed to place your bet on 'Liverpool to win vs West Ham' in the 'Match Winner' betting market at standard odds. A max bet of £1 is eligible for the enhanced odds payout. If your bet is a winner, you will receive your standard winnings paid as cash, plus the enhanced winnings paid as free bets. This offer expires on as soon as the match starts. Hurry up! Open a new Sport Nation account right now and take advantage of this promotion! 2. Your first bet must be £1 (max qualifying stake) on Liverpool to beat West Ham. 3. If they win you will be credited £50 bonus funds with turnover requirements at minimum odds of 2.00 with a minimum stake equal to the combined value of 8x your bonus funds received and once such bets have settled, any bonus funds and winnings remaining will become withdrawal. System bets will not count towards the wagering requirement. 4. Customers will have 30 days to meet the turnover requirements before the bonus expires. 5. This offer is valid to use once per customer. 6. Offer expires at kick off. 7. Whenever bonus funds are issued as part of any promotion or otherwise, a players real money balance will always be used first when placing Bets before any bonus funds can be used. 8. You are not eligible for the normal welcome bonus. "Claim 50/1 Liverpool to beat West Ham at SportNation! Max bet £1"